The new Plane & Pilot stands for a lot of things the old brand did, including our embrace of low-and-slow and alternative forms of committing aviation. Beyond that, we stand for a few more beliefs that bear comment, some of which are right in line with what P&P has always believed and shouted that fact loudly. Others are things we always believed, but never said out loud, and still others, as you see, approach flying from a different perspective. Here you go, and please, after you’re done, I’d love to get your feedback. My email address is [email protected]. While others lose their way into the worlds of drones and commercial aviation, Plane & Pilot is all about the flying. You’ll notice that the folks I introduced in the last issue (and those who will contribute to the magazine in future issues) are nearly all active pilots who fly now and have been flying for some time. When we write about flying, we write with authority, because we’re out there doing the very thing we’re writing about. When we write about jets, we do so with a type rating on our ticket in our wallet. When we discuss flying more safely, we do so from a perspective of being out there on the line, flying with real students in real airplanes and dealing with real issues. It’s not theoretical. It’s us out there flying. Flying has risk, and if you think it doesn’t, then you need to rethink it before your next flight. The key to this activity we all love so well is to learn how to recognize the risks and cut them as smartly as possible, while still doing the aviating thing. The landing place for where acceptable risk lies is a fuzzy line. For some, night flight in a single is a nonstarter. 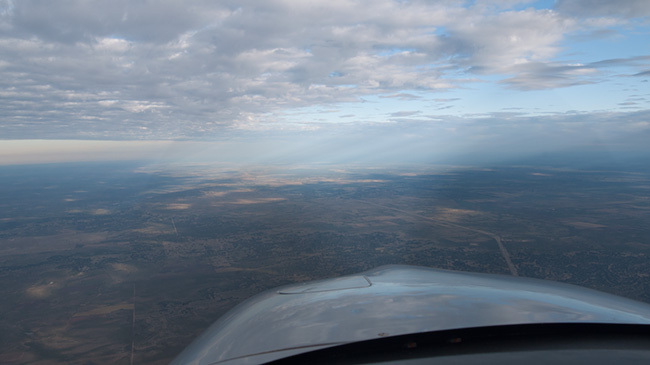 For others, night IFR in a single is a core part of the plan. We respect all of those landing zones. Where we part company is with pilots who flout the risks. Is flying as safe as driving a car? When it comes to light GA, the answer is a resounding “no.” Our goal is to make it as safe as we can make it for our own needs and style of flying. We all hear it all the time: Flying costs too much. I don’t disagree, but I do believe that flying can also cost a lot less than most people realize. For the cost of a new Ford F150, or less, you can get into a nice, useful airplane that opens up the joy of flight in remarkable ways. If you go in with a partner or two, the investment is even less. Those pilots who own really nice airplanes, be it a P-51, an SR22 or a Citation CJ4, are making the most of the talents and resources they have to fly missions that matter to them in some really great airplanes. We celebrate them, just as we do the pilot who owns a 1946 Globe Swift with a buddy. The world of flying contains multitudes. The safety record of GA, and, in particular, light GA, is bad. While it’s getting better, it’s still not close to being what we need to accomplish to make flying an activity that will grow and prosper as it should. Many would-be pilots stop short of the cockpit not because they fear they can’t learn to fly; they’re concerned that flying isn’t safe enough. The solution for us isn’t to cook the statistics on risk, but to lower the risk. Can we achieve zero accidents? Of course not. But to act as though the hundreds of accidents per year we suffer are somehow tolerable is wrong. We’ve done a pretty good job of identifying the ways that people come to harm in airplanes. We need to do a better job of figuring out how to prevent that from happening and then to actually prevent it from happening. We applaud the efforts of those who are hard at work at this most important mission, and we put our money where our mouth is. Plane & Pilot is proud to be a supporter of the EAA Pilot Proficiency Center at AirVenture this year, an effort that, as you may know, I’ve been personally involved in for the past several years, even though it cost money and returned zero in revenue for the investment. The real return is hard to measure: accidents that didn’t happen. There’s a common notion among some that flying is for a special breed of rugged individuals who have the right stuff. Anyone else need not apply. We agree wholeheartedly that pilots are special, but we don’t believe that pilots are born. They’re made. Can or should anyone be a pilot? Clearly not. There are all kinds of reasons why some folks should stick to letting others handle the flying chores. But the number of people who can become pilots is vast. We say “boo” to the idea of aviation being an exclusive club. Everyone is welcome. There are all too many self-proclaimed experts out there who let their curmudgeonly ways creep into their forecasts for flying’s future. The best years for aviation are behind us, they say, and we’re here riding the last wave of aviation joy as the sun sets behind us. It’s nonsense. Those of us who study the history of aviation know that the popularity of flying waxes and wanes. The biggest factor that creates new planes and new pilots, however, is always the same: new technology. These folks apparently think that all the ideas have already been dreamt up and that all of the potential technologies that could drive aviation growth have already been invented. They need to open their eyes. I’m certain that over the next two decades we’ll see new structures, new forms of propulsion and new safety technologies that will lower costs, cut risk and open flying to millions of potential pilots. How can I be so sure? These technologies are already in the works. In our Future Flight space, Senior Technical Editor Grant Opperman explores just such technologies, those that are mostly not quite ready for prime time, but that all have the potential to change the game we love. The question behind all of his reporting is the same that drives aviation researchers, engineers and dreamers: “What if we __________?” (insert cool idea here and then get to work answering the question). I try to avoid absolute statements when discussing aviation, not because I’m afraid of being wrong, but because I’m nearly certain that I will be. That said, here’s one I’m sure about: Every pilot loves technology. I hear you saying, now wait just one minute, what about those pilots who, if they have radios, turn them off when they go bashing around in the bush in their taildraggers? We hear you. When you compare that kind of flying to Gulfstreams and even a modern flat-panel-equipped Skyhawk, you’re right. It’s low-tech, but not by any stretch is it no-tech. But airplanes, by their nature, don’t just use technology, they are technology. As far as I know, flight still requires an apparatus of some sort. I’ve seen Usain Bolt do his lightning-fast thing on TV, but as fast as he is, he’s still not actually flying. The machines we’ve created to enable flight are magical (in a scientific sense, at least), and we all have a special attachment to them, quite literally, in fact; it’s in the regs. We might have forgotten just how remarkable an achievement it is that people can fly, but we shouldn’t lose sight of it. It’s an incredible thing, and it’s changed everything. That’s why Plane & Pilot has aviation technology at its core and why we take such an interest in exploring any particular corner of science that opens our eyes and opens new avenues into more efficient, safer, cheaper, more useful or more enjoyable flying. Whether that technology is contained in the nacelle of a new fire-breathing turbine or the plastic case of a new device designed to help us find our way among the planes and peaks and airways, we’ll take a deeper look at it. Which is what I say to you all right now.